Color in the pictures of the dog, duck, and letter D d and then practice writing the letters by tracing the dotted lines. Here's a headband with a giant D on top. Illustrations of a duck, a deer, and donut are shown on the front. Students will practice printing the lower-case letter d; Trace the dotted lines. Another lower-case letter d handwriting practice worksheet; Trace the gray lines. 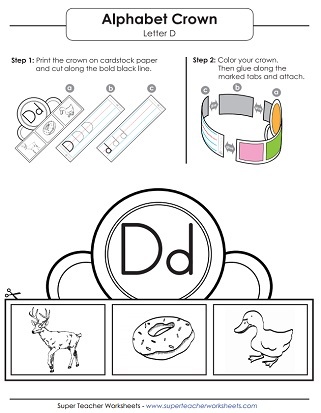 Practice handwriting capital letter D on this worksheet by tracing the dotted lines. 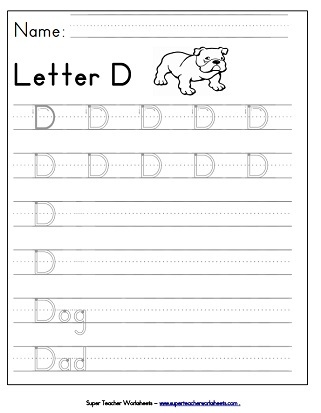 Trace the gray lines to practice writing upper-case letter D on this printable worksheet. Learn to recognize D d, and practice writing it. After that, think up a word that starts with d and draw a picture. Practice letter recognition by daubing circles in the shape of letter D.